Well, they're making an Attack on Titan movie. Good for them. 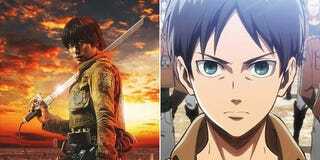 We now know what the actors look like in their Survey Corps uniforms. Let's see how they compare with their anime and manga counterparts. The manga debuted in 2009, and the anime incarnation began in 2012. Personally, I don't think the manga and anime versions should be exactly the same as they are different mediums. You know what, I also think it's fine if the live-action ones are reworked to suit movies. The most important thing is that the anime and live-action versions should be done well. And that isn't easy—especially when it's necessary to manage the expectations of the original fans. We haven't seen a trailer yet. The Attack on Titan movie could be brilliant. It could be garbage. Right now, it's hard to gauge. So in the meantime, let's see how the actors stack up against the anime and manga characters. Actor Haruma Miura as Eren Yeager. Dallas-born actor, model, and singer Kiko Mizuhara is Mikasa Ackerman. Actor, model, and singer Nanami Sakuraba is Sasha Blouse. Actor Takahiro Miura is Jean Kirstein. Satomi Ishihara, currently one of Japan's most popular actors and models, is Hange Zoë. Actor and model Kanata Hongo plays Armin Arlert. The movie is being shot in Japan on Gunkanjima and will depict a world that's been destroyed by the Titans. The live-action version will also feature original elements as well as characters created specifically for the movie, and will be released next year in Japan.